NEWS: £10,000 lottery winner announced! After 50 weeks rollover, we have our record breaking £10,000 jackpot lottery winner! Congratulations to 86 year old Jean Higginson from Estover. 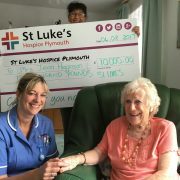 Here’s the moment nurse Teresa went to hand over the big cheque. Thank you to everyone who supports our weekly lottery. Since 1994 you have helped raise over £10 million for patient care. That’s enough to care for an incredible 10,000 patients at home. Could you be our next big winner? Our lottery is now available to play online from £1 per week. https://www.stlukes-hospice.org.uk/wp-content/uploads/2017/08/IMG_4004.jpg 3024 4032 Robert Maltby https://www.stlukes-hospice.org.uk/wp-content/uploads/2018/04/stlukes-logo.png Robert Maltby2017-08-07 09:52:132018-04-18 12:42:24NEWS: £10,000 lottery winner announced!